Alder Valley had from the start a formidable interest in operating coaches on private hire and excursion work. Coaches were also operated on the express routes to London. Seven good quality coaches were acquired from Aldershot and District all AEC Reliances, two with Plaxton bodies and five with Duple. There were also some time expired Reliance's from A&D and Bristol RE's from Thames Valley that had been demoted to bus work. 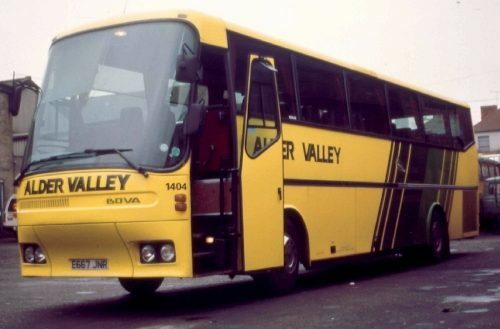 The first coaches to be acquired by Alder Valley were five Leyland Leopard / Duples from Southdown in 1975 these starting a trend as all future deliveries of private hire coaches were second hand. The next came in 1982, four Leopard / Duples from the independent operator Fox's Coaches of Hayes followed in 1985 by three Tiger / Plaxtons from Ebdons of Sidcup and four MCW Metroliners from Eastern National in 1987. 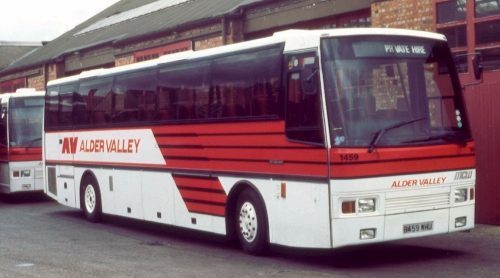 In 1989 Alder Valley took over the operator Whites Coaches of Baughurst whose fleet was quickly disposed of except five Bova coaches which were of good quality, one Europa and four Futura's. The Futuras becoming the flagships of the recently formed coaching unit Alder Valley Coaches. Also from Whites came one Setra but it was only used a few times and never appears in fleet lists. It was disposed of to Kentishman Coaches after only being used for a few days. The coaching unit also had the high floor Tigers cascaded down from the Reading to Heathrow Rail-Air Link. When Stagecoach took over Alder Valley in 1992 all these coaches were quickly disposed off and coaches have never been allocated to Aldershot depot since.